This mini top hat free pattern and tutorial uses a template to make this accessory possible. Cute and chic, these mini top hats are all the rage. Whether you’re into Steampunk, Burlesque or classic Victorian this Mini Top Hat is the crowning piece to your costume. 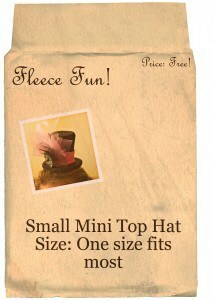 Make the perfect mini top hat in the perfect size that you want. Sew and No sew options available. The .pdf pattern printed on card-stock. No sew will work for all the hats sizes. However, it works best for the small and mini sizes of hat. You will need to print the pattern onto card stock as the pattern will become part of the hat . 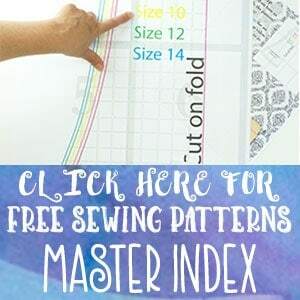 Cut out the and assemble the pattern – be sure to tape the front and the back of the pattern seams (where the paper overlaps) . Trace the pattern onto the cloth using a marking pen (or even a regular pen – as long as it doesn’t bleed through the fabric. Be sure to trace the brim twice; one with a hole in the center and one without. Then cut down all the pattern pieces to the dotted line. You now have four pieces of fabric cut out. set the brim piece that does not have a hole in the center aside. Spray the back side of the card stock with glue and center on each piece (there should be about a.5 allowance all the way around – except for the hole in the center of the brim. That should just line up with the fabric. 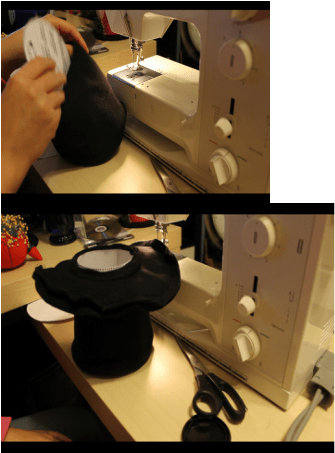 Using a glue gun, fold over the excess fabric and glue down along all the edges of the pieces with the exception of the brim pieces. Note: I did this differently in the example – but trust me it will look better if you do it later – I’ll tell you when. Taking the wall piece, gently fold it around so the two ends barely over lap. Glue ends together, be sure to hold it for a while to secure or use a clothes pin or clip to hold it in place. Once the wall is secure it’s time to add the top of the hat. Using your glue gun, glue around the the top part of the wall, just barley on the inside place top on glue hold in place to secure for a few seconds. 5 – Add the first piece of the brim. 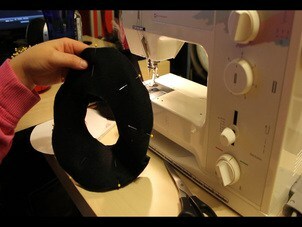 Place glue on the bottom of the wall of the hat (lining up the bottom circles) and press firmly onto the brim. You may need to hold this for several seconds to ensure it is well glued. Tip: Place the seam where you will adding all your feathers and tulle – that way it can be covered. In my example I placed the seam slightly to the right of the of the front. The brim is an oval shape – the sides should be the thinest part of the oval and the brim should be wider at the front and back of the hat. For extra support tape a few pieces of tape between the brim and the wall of the hat. 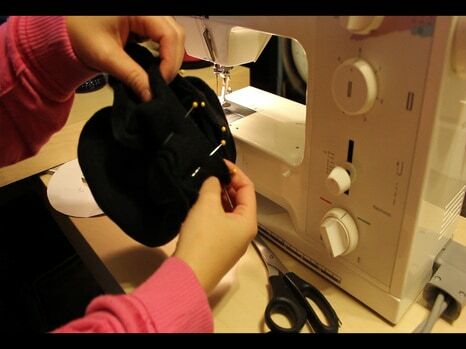 Using your glue gun, place glue on the brim card board and place remaing piece of the brim on it, sealing off the hat. Then Using glue all along the edge of the brim fold over .5 excess of cloth to finish off. Note: Excess is already folded over in the example in the picture, but it will make a nicer edge if you do it this way. Add a couple of clips or a comb to make it so it can stay in place. You can glue them directly or use a scrap of fleece to glue them on. You could also use a length of elastic thread and make it stay on the head like a party hat. This for me is the best part! Add ribbon, tulle, beading, feathers, buttons, brooches, glitter, you name it and make this hat your own. I used tulle, feathers, ribbon and a button in the example. Old jewelry would work well too. Sky is the limit and your creativity reigns – what will your hat look like? Send me a picture (angel@fleecefun.com) or feel free to post it to the Fleece Fun facebook page! Trace the pattern onto scrapbook paper and make hats from paper for an even cheaper alternative. The Mini size is so stinkin’ cute on little girls and babies – awesome for photos (even better when paired with the “Fun and Frilly Skirt” get the free tutorial here. Dress up a forgotten stuffed animal – and give an old toy new life. 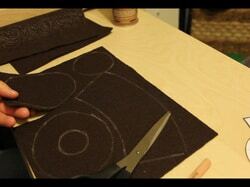 1- Cut out the pattern. If the thought of using a glue gun for everything makes you cringe here is a sew option for you. 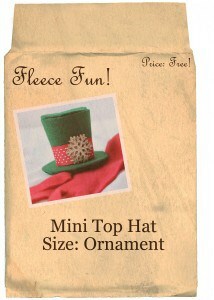 You will need to print the pattern onto card stock as the pattern will become part of the hat . 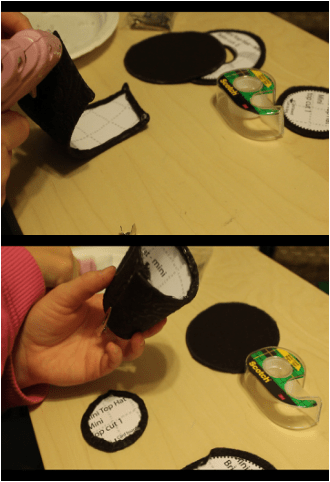 Cut out the and assemble the pattern – be sure to tape the front and the back of the pattern seams (where the paper overlaps) . Trace the pattern onto the cloth using a marking pen (or even a regular pen – as long as it doesn’t bleed through the fabric. 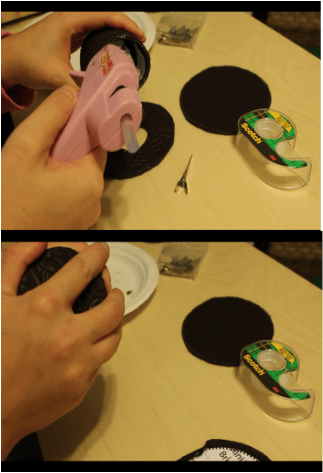 Be sure to trace the brim twice with a hole in the center. Then cut down all the card stock pattern pieces to the dotted line. Note: to make the hat extra sturdy you may want to consider gluing the carstock to poster board and cutting out the poster board wit the card stock. The card stock with teh posterboard will make for a much sturdier hat. With right sides together pin fold the wall in half and pin ends. With right side facing down (right sides together) pin the top on to the top of the wall ( the wider end). 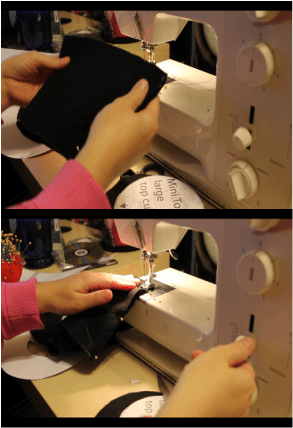 sew together using a .5 seam allowance then trim down the seam. With rights sides together sew the outer edge of the brim together using a .5 seam allowance. Trim down the seam after finished to eliminate bumps. With right sides together pin ONE side of the brim to the wall of the hat (see picture). Sew together using a .5 seam allowance. Trim down the seam after finished to eliminate bumps. Tip: Place the seam of the wall where you are planning on adding your decorations. This will allow the seam to be covered. Note: The reason you sew on one side of the brim is to allow you to insert card board into the brim later. 6- Insert the hat form. Piece by piece insert the hat form starting with the top of the hat. you will need to bend each piece a little when inserting, this is why card stock and poster board works but a harder cardboard would not. Roll up the wall and insert it into the hat. Line up the seam of the wall with the seam of the hat. Tape the cardstock seam in place and tape the wall to the top. Flip brim right side out and carefully work in the brim piece (you may need to cut a couple of small slits in the under brim to get this to work. On brim form is in place tape it to the wall. Now decorate your hat!This for me is the best part! Add ribbon, tulle, beading, feathers, buttons, brooches, glitter, you name it and make this hat your own. I used tulle, feathers, ribbon and a button in the example. Old jewelry would work well too. Sky is the limit and your creativity reigns – what will your hat look like? Send me a picture (angel@fleecefun.com) or feel free to post it to the Fleece Fun facebook page! I would really like to create a mini top hat, but I’m having a lot of trouble downloading your pattern?? I already have the pdf creator downloaded to my computer. Would you be able to email it to me? The files are up and functioning properly. try a different internet browser. Double check the settings on your computer’s pdf program for internet file downloads. I’m having lots of trouble with the download — McAfee tells me the software is harmful. You need to use Adobe pdf – I don’t recommend any other software. You can find adobe here – http://get.adobe.com/reader/ to download the pattern – click on the pattern envelope. These are adorable! Thanks you so much for creating and sharing. You’re very talented!! Hi, I just started this and love the pattern but was wondering once it’s done, what do I attach to it to make it wearable? I didn’t see that in the instructions…did I miss something ? Thank you! A couple of alligator clips or a comb to the bottom will work to keep it secure on the head. Hi, Cannot wait to start on this project. Which size hat was made in the tutorial?? The one that I made (in the brown) is the mini size. The one one the model is the small size. 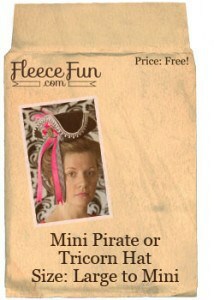 I bet your mini hat will turn out cuter than the one in the stores and save you a few Quid in the process! Hi, This is an absolutely fab project. Is it possible to make a mini bowler hat too? The bowler is more difficult because of the dome shape of the hat. 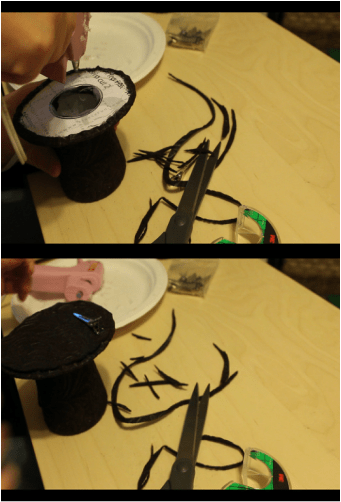 What you might try is getting a paper bowl, gluing felt to it and fashioning a brim from there. I just made one of the minis in powder blue and pale pink and it is just. so. darn. CUTE!!!!! It was absolutely perfect for the Alice in Wonderland photo shoot I did with my kids! Thank you so much for such a wonderful tutorial as well! Super excited to try these patterns. I am wanting a professional finish so I am thinking that the sew version would be best. I only wish the video tutorial showed the sew version as well. Is there a link to that? No there isn’t a video – Just the written instructions. the patterns and the tutorial are great and I can’t wait to try them out! I had a little problem, though. As it was impossible to use the measuring tool in Adobe Acrobat or open the PDF in InDesign or Photoshop, it was rather hard to find out the exact sizes of each hat if I didn’t want to print it all out first. So would it be possible for you to post the approx. height/circumferences here somewhere? Thank you and keep on doing great stuff! sizes for the hats have been posted on the page. I am so excited about these patterns! I am making the pirate hat for all my grandsons and the top hat for my granddaughters! I am going to try both felt and fleece to see which one works best for me….I have both fabrics on hand! You are so incredibly talented and I just wanted to say thank you for sharing with the rest of us!!! Oh my goodness!!! I have looked and looked for this everywhere. My son is going to have a mad hatter themed birthday next year and I can’t afford to buy the premade hats and I had the hardest time finding a pattern to make them. You just make me sooooo happy!!! I can’t wait to start making them. He will be two, so I was thinking instead of crazy twos, we’d have mad twos. Thanks so much!!! Thanks so much for posting this! I love mini top hats, and it will be wonderful to be able to customize them for myself! Thank you so much for the well detailed instructions, the hat was quite easy to make! I’m having a Mother’s Day Tea Party and made one for myself, a friend celebrating her b-day, and will raffle one for someone to wear at next year’s event. 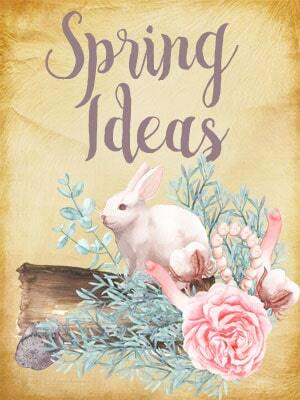 There are so many options out there for decorating them, too! Super easy pattern to follow, sewed the entire thing, added a veil and sash, and this took less than an hour to complete, totally recommend this pattern to anyone that asks. Thank you so much for these hats. I have found other tutorials but they don’t give you a pattern, and the are not as through in their directions. So thank you so much. OMG this is perfect, I’m just getting back into creating and my daughter (turning 18 in a month :'( ) is in a hat phase, only thing I can’t do atm is print off the patterns! going to get a friend to if he can so I can make these for my baby girls and my nieces. Becky you’re welcome! Thank you for all the nice compliments. Best of luck with your projects! How wonderful LeeAnn – glad your project worked out! thanks so much for posting this! have always wanted to make mini steampunk hats for comiccon. im using the mini template for matching hats for me and my daughter for D23 next weekend to match our polka dot minnie mouse pinup girl dresses. we have polka dotted ribbon and large daisy flowers to go on these. should look cute! Awesome – thank yo so much! Thanks so much for this! I made my daughter a silk version for a mad hatter costume, it turned out so cute! So happy it worked out for you! Feel free to post a picture of your work of Fleece Fun’s Facebook page! Thanks for the great website. I have a question about the sewed version. The .5 seam allowance..is that 1/2 inch? Thank you so much, great tutorial. Can’t wait to try to make one myself. 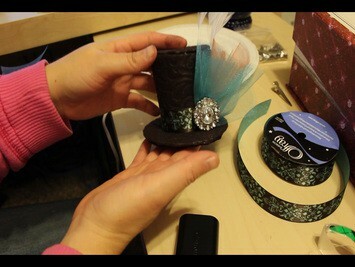 Hi, I would love to create this mini top hat, but I don’t have card stock. What is a good replacement? Thank you for this pattern! I just made the large mini top hat for my 2 1/2 year old’s silly hat day at daycare. It was a big hit! She loves wearing her “silly” hat! How Fun! So glad your project was a success! Finished the medium top hat for the White Rabbit in a high school play. Looks awesome. Thank you for the pattern! I want to do these for my daughter’s birthday. With 72″ felt, how many could be made out of the 1/4 yard the pattern calls for? I’m sorry I honestly don’t know. It depends on what size of hat. I would lay out the size you wanted and measure the space it takes up and calculate it that way. Thank you for this pattern and cute top hat tutorial. I was thinking with a small adjustment making it cone shaped, it can be a witches hat for Halloween. Going to try it out. You saved me so much time trying to figure this one out…thank you again! Just downloaded your Trapper Hat and have been checking out your other tutorials – the extra ear flap for warmth is excellent here in the mountains. The tuts are well explained and easy to understand. The video is a great asset for anyone making the pattern. Several males in my life are getting a Trapper Hat for Xmas, as am I! This tutorial is so cute and so topical. I see people headed to parties wearing them. Don’t know how I’ve missed your site. Plan to tell everyone. Thanks for taking time to share your knowledge. Mahalo Angel! your video and all your instructions were so easy to understand and fun. I cant wait to start doing more projects. Will be making this top hat and hopefully post a photo on your fb page. thank you for the free pattern. I LOVE THE TOP HAT THAT IS ON THE CHRISTMAS TREE. IT JUST REMINDS ME WHEN MY HUSBAND AND I WERE FIRST MARRIED HE WAS IN THE SERVICE AND WE WERE STATIONED IN JAPAN. WE WERE JUST NEWLYWEDS AND DIDN’T HAVE MUCH MONEY SO I DECIDED TO MAKE ALL MY ORNAMENTS AND THE TREE TOPPER. THE TOPPER OF COURSE WAS A TOP HAT. ALTHOUGH MINE WAS MADE FROM CRAFT FELT AND CARDBOARD IT WAS VERY SIMILAR TO THE ONE YOU HAVE DONE HERE. EVERY YEAR AFTER THAT I MADE THE TOPPERS DIFFERENT AND DIFFERENT ORNAMENTS BUT IT WAS VERY SPECIAL TO US. I KNOW LONGER DID THIS AFTER THE KIDS GREW UP AND MOVED ON BUT IT BROUGHT BACK SO MANY MEMORIES FOR ME. THANKS FOR SHARING! Thanks for this fabulous and accurate pattern! I searched quite a bit and this one is great. I altered a bit and made out of paper in a little larger size. I’m going to use as party favors for my Alice in Wonderland party in June! Hi! I was looking for a top hat pattern for my Poppy Parker doll and came across your marvellous design. I scaled it down to 47% as her head is quite small. 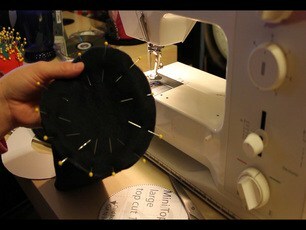 As I don’t own a glue gun (note to self must get one) I decided to sew my hat….feeling very nervous at this stage! To cut a long story short it’s turned out amazing, I hope to take a photo when the rest of her outfit arrives…trying for the steampunk look. I’ve knitted a cardigan in angora and customised a Sparkle Girlz dress, just waiting for net stockings and black boots. So happy to hear of your success! I just Love these little top hats. These are SO cute (and cool!) I am really into steampunk lately and couldn’t find a free pattern that I could download. Thank you so much!